www.health.auckland.ac.nz: Part of the University of Auckland’s Faculty of Medical and Health Sciences. 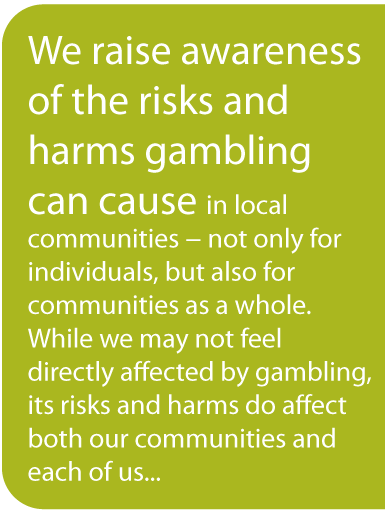 Conducts research to reduce harm from gambling and to promote gambling related wellbeing in communities. www.easg.org: Acts as a forum for knowledge dissemination regarding gambling in Europe. www.gaphai.org: Consists of members from around the world who work collaboratively to eliminate gambling harm. www.gambling-law-us.com: website provides information on gambling laws at both the State and Federal levels governing the legality of various types of gambling and gaming. gamingresearch.blogspot.com: provides up to date problem gambling research and resources. www.tandf.co.uk: peer reviewed interdisciplinary journal. Offers a trans-national and comparative approach to problem gambling. Features a forum section. www.springerlink.com : free on line journal, published twice a year, providing a forum for researchers, clinicians, policy specialists, educators and community workers on topics including mental health and addictions, policy, literature and treatment. www.ncpgambling.org: a National advocate for problem gambling programs and services. Advocate for public awareness. Activities include: operating a helpline network, gambling counsellor certification, host conferences, resource distribution, organize problem gambling awareness week and provide education. Website provides information and links to many state affiliate websites. www.ncrg.org: a national organization devoted to funding independent, peer-reviewed scientific research on pathological and youth gambling. Website provides useful links. www.isdc.ch/en: this website contains legal and economic reports on gambling across the European Union. www.rigt.org: Raise awareness about problem gambling, commission treatment, prevention and education, and research into problem gambling, for the United Kingdom. www.basisonline.org: a free on line research bulletin published by the Division of Addictions at Harvard Medical School.